Facebook, Twitter, LinkedIn, Instagram, Pinterest. I don’t need to explain what social media is because chances are you’re plugged into one, if not most, of these social media platforms. And individuals aren’t the only ones engaged in social media. Eighty percent of businesses, 89% of NGOs, and 66% of government agencies are also a part of these networks– connecting, sharing, digesting, and discussing information with their followers and fans. Water managers can engage more productively with their stakeholders. The District of Columbia Water and Sewer Authority serves 16 million customers in Washington, D.C. but only reaches 130,000 of them through bills and other traditional communications. So in 2009, they launched a social media campaign to reach a larger segment of their customers. For example, DC Water promoted Twitter as a channel for customers to report problems, resulting in fewer e-mails sent to the general purpose inbox. The utility has also been able to help consumers understand where their water comes from and how it is priced, and answer questions as they come in. 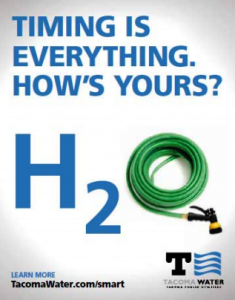 Similarly, Tacoma Public Utilities launched their Know your H20 social media campaign in 2010 to raise awareness of the utility’s conservation programs. Using Facebook, Twitter, and other online media, Tacoma Water sent out an online survey to their customers about their water-use habits to inform their efficiency goal-setting process. Social media engagement allowed both water utilities to meet and even surpass their original goals and deliver an overall better service to their customers. Beyond that, it primed the utilities to learn what was working and what potential areas could be improved to build a better brand. Social media helps mitigate risk and promote best practices. Because about 70% of the freshwater water withdrawn globally supports agriculture, farmers are among the most important water managers. Water efficiency is especially important to agriculture since it has been also one of the industries most immediately impacted by climate change. As farmers worldwide struggle through droughts and floods, they are finding new ways to communicate with one another and are utilizing social media to open new windows of opportunity. In 2009, British farmer Michele Payn-Knoper founded AgChat, a moderated Twitter conversation for folks “involved in the business of growing food, fuel, feed, and fiber” that takes place every Tuesday night. Over the last four years, nearly 10,000 people from ten countries have attached the hashtag #agchat to their tweets to discuss issues and share ideas related to food and farming. Stateside, grain farmers are tuning into Twitter to get information that would help them decide how and when to market their crops. During 2012 – the hottest year on record – a growing number of farmers like Bill Graff, who grows 1,400 acres of corn, soybean, wheat, and hay in central Illinois, used social media to get updates from crop scouts who shared photos of crops they visited around the country and gave basic information about insects, weeds, and diseases. The information was not only free, but also a faster alternative to the USDA’s weather and crop updates. Other efforts have been made to build resilience to climate change across the northeastern United States. The idea came after Hurricane Sandy when farmers were left to deal with their unexpectedly inundated crops. The Extension Disaster Education Network (EDEN) in New York links Cornell Cooperative Extension educators; emergency management agencies (including FEMA and the Department of Homeland Security); and local officials and community members to increase agricultural resiliency to disasters. Less than 24 hours after Sandy had passed, Cornell and SUNY experts in the area put together an informational fact sheet about the impacts of saltwater inundation and how to mitigate damage that they were able to distribute via social media and the EDEN website. Moving forward, the USDA plans to build on existing infrastructure to establish “regional hubs that will provide technical support, assessments and forecasts, and outreach and education” to farmers. It opens up opportunities to reduce (water) waste. Water managers are not only implementing social media in their conservation efforts, they are also using it to reduce waste. Take Bloomfield Farms in California for example. General Manager Nick Papadopoulos devised a plan to reduce the amount of unsold produce that was being thrown away after selling at the farmer’s markets over the weekend. Rather than have them spoil and go to waste, he marketed the food at a deep discount on the farm’s Facebook page every Sunday night. Not surprisingly, there was a demand for discounted leftover produce, and groups of homeowners in the neighboring communities and local gourmet food businesses regularly purchased the food. Encouraged by his success on Facebook, Papadopoulos started the website cropmobster.com, where those involved with food production and hunger relief and those who want to buy local can access surplus produce. A recent study found that, depending on the time of year and demand, up to 30 percent of fresh crops grown in the U.S. don’t make it to market. Cropmobster.com launched this March and has since salvaged more than 20,000 kilos of food between non-profits, restaurants, and individual buyers – and that’s a lot of water embedded in growing those 20,000 kilos. 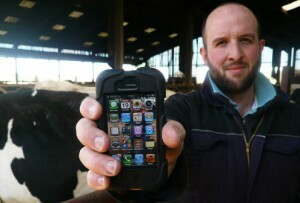 More apps and social websites that connect farms with food banks are also emerging. According to Voice of America, a company based in San Francisco is working with a grocery chain to cheaply market perfectly good produce that doesn’t meet the size and quality standards for sale in a U.S. supermarket – for example an apple that is only 37% instead of the required 40% red. Whatever the goal or challenge, water managers of all kinds can leverage social media to streamline current systems and find economical solutions. Water management is a centuries-old practice, but water managers who want to lead in their industries need to also use 21st century tools to deliver the best service or product and sustainably meet current and future demands. I just got started on Twitter. Follow me on Twitter at @nicholuu.